Our seniors got back to winning ways with a deserved three point victory away to Bright last Friday evening. The game was a close run contest with the ‘Fin leading 2-05 to 1-05 at the interval. Both sides scored 1-07 apiece in the second half with minor player Oran Flanagan starring after being sprung from the bench when the game was evenly poised scoring 0-05 in the last 20 minutes of the game. Final score Bright 2-12 Aughlisnafin 3-12. Match ball sponsor was Rory Murphy and family. Next game is at home to Newry Mitchels this Wednesday evening at 7.30 pm. 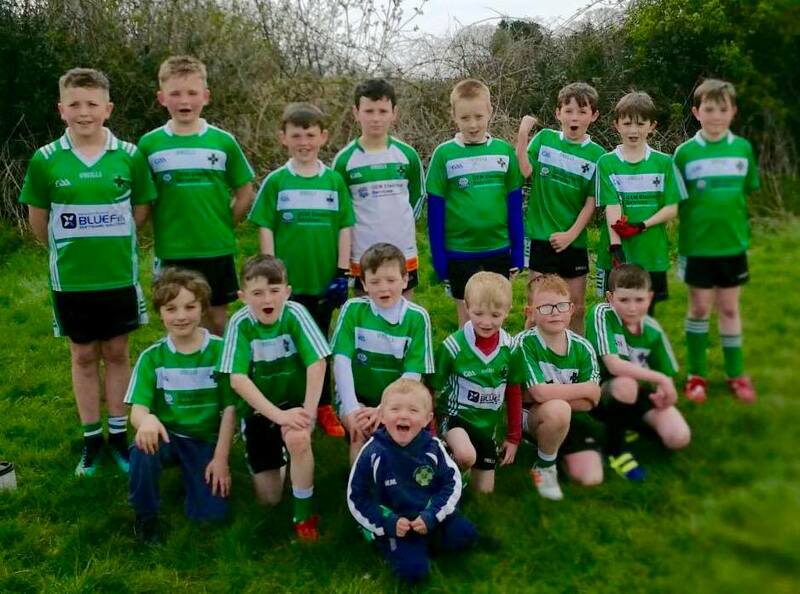 Ballylough minors made it two wins in a row with a workmanlike performance at home to Liatroim. With better decision making the margin of victory could have been greater but a first clean sheet was a real positive from the game. Final score Ballylough 3-08 v Liatroim 0-09. Scorers for Ballylough were D McMullan (0-01), E Lundy (1-01, 1f), A Flanagan (1-00), S Croskery (1-03, 1f) and A Gilmore (0-03, 1f). Callum Haynes, Barry Rogan and Damian McMullan strong in defence while Rory McMullan put in a great shift in midfield in the absence of team captain Oran Flanagan. Next game will be the toughest test to date with a trip away to Burren on Tuesday evening. Our U16’s were outplayed for the most part by a very strong Carryduff A team last Thursday evening in the final All County league qualifying round. Morgan Croskery top scored for the ‘Fin with 1-05 for the third game in succession having posted the same tally in recent victories over Castlewellan and Saul. Oran O’Connor grabbed a brilliantly executed back heeled goal and Aaran Flanagan floated over a superb point from distance. Despite posting 2-05 over the hour it fell well short of Carryduff’s return which sees them progress to the All County A League with the ‘Fin joining RGU Downpatrick, Loughinisland, Castlewellan and Saul in the East Down U16A League. There will be two rounds home and away with the first game at home to RGU next Monday 7th May at 7.30pm. Training continues this Thursday at 6.30 pm. Our U14’s were away to St Paul’s on Monday night where they were hoping to maintain their winning start to the season. Our U12’s were awarded a ‘walk over’ victory against Bright who were unable to field on Sunday morning. On Wednesday past they lost to Bredagh C. The Fin battled gamely both halves in the game played out under two rainbows over Pairc Baile Anna. There was no pot of gold but plenty of players worth their weight in gold. In nets we had the steady David Steen who saved a penalty in the second half, the back four of Ryan Quinn, Conor OHare, Caolan Flanagan and Ryan Croskery were superb. In midfield Joseph Steen (0-1) and Marty Og Flanagan (0-2) got up and down the field all evening. The forwards Sean Croskery, Harry Keenan (1-02), Dillon Fisher (2-02) and Odhran Murray did extremely well against a strong Bredagh rearguard. Subs Jude Lenaghan, Shea Boden Hall and Brogan Clarke all came on in the latter stages of the game and got involved, Brogan nearly bagging a goal on his debut. Our Year 6’s & Year 4’s both enjoyed five games on Saturday morning at the second East Down Go Games Blitz at Pairc Baile Anna. Bredagh and Darragh Cross both brought two teams and St Pauls were also in attendance. The ‘Fin were very impressive in all five games scoring plenty of goals and points with very good execution of the various skills from all players on the day. Thanks to all the visiting teams, mentors, officials and our club members who helped set up and co-ordinate the blitz which ran like clockwork. Marc Quinn and Ethan Murray enjoyed their first Down U14 ETS football coaching session on Saturday morning with former Down star Benny Coulter in attendance. Morgan Croskery attended the U16 ETS session the same day. Well done to the Down minor footballers on their excellent win over Armagh in the Ulster Championship. Down will now meet Tyrone on Saturday 12th May in round 2. Bookings have started to pour in for the 4th annual ‘Fin Fun Mud Run’ which will be a two day event Saturday16th & Sunday 17th June 2018. You can book via the link on our club’s website www.aughlisnafingac.com or via our dedicated facebook page ‘Fin Fun Mud Run’. Book early to avoid disappointment.